Meath Fire Blazers at the Race Around Ireland finish. Trim GAA, Co Meath. 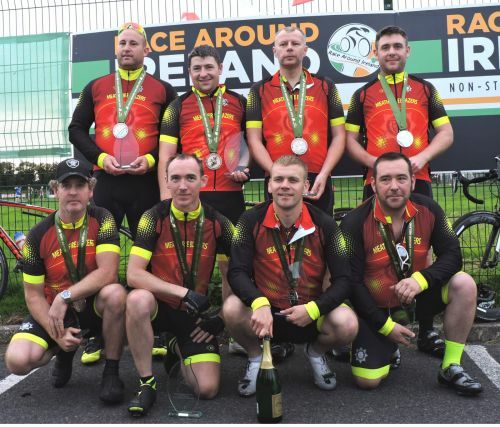 Meath Fire Blazers have certainly scorched a trail around Ireland this week and they have completed their 1175km Race Around Ireland odyssey in a time of 77 Hours 1 Minute to win the eight-rider team classification. The crew captained by Brian Rogers with Trim native Ian Caldwell, Matt Smith, Gary Ayton, Barry Quinn, Seán Mulligan, Thomas Nelson and Gavin Shipp all sharing the riding duties have raised much-needed funds for Meath Hospice in their three-day non-stop epic. The octet have relayed throughout in a relentless tour of the island racing across the toughest terrain in European ultracycling and in some of the most inclement weather seen at the event in its history. Meath Fire Blazers have led throughout and drew inexorably clear of their nearest opponents Team Spokes Women as the kilometres wound down. Reaching Trim GAA Club to conclude their successful bid for honours, the locally-based team had over 100kms in hand over the second-placed team. Trim CC Wins Race Around Ireland 4 Person Team Category! Trim CC at the Race Around Ireland finish. Trim GAA, Co Meath. Home favourites Trim Cycling Club raced into their home town to win the teams section of the tenth edition of Race Around Ireland. Michael Molloy, Fergus Fagan, John Lee and Alan Kearney rode in relay throughout the 2175km race to finish as the first riders to complete the distance of Ireland's toughest sporting challenge. 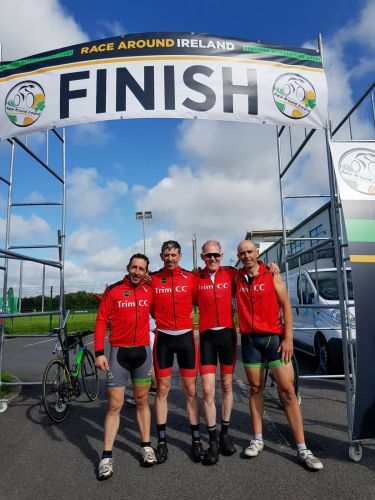 The quartet arrived back into Trim GAA club side by side to celebrate their overall teams success and their victory in the four-rider team category. Racing non-stop since Sunday afternoon the quartet averaged over 30km per hour on their circumnavigation of Ireland in what has been some of the toughest weather the riders have faced in the history of the event. Molloy, Fagan, Lee and Kearney were never headed throughout the event but the issue was far from settled even well into the final day after a superb four-way scrap for honours with Team Indreni Think Lalwlors, Breffni Wheelers and Over the Hill CC. They eventually arrived back into their club's home town after 68 hours and 17 minutes of continuous bike riding while their nearest rivals were 20km from the finish. The squad brought considerable cycling and adventure racing pedigree to the event. John Lee from Ballivor was the 2015 National Masters Hill Climb Champion, the 2016 Veterans Leinster Road Race Champion and the winner just last week of the Leinster Masters Hill Climb Championship on Long Woman's Grave climb. Fergus Fagan, from Kilbride, Trim only took up cycling at 38 but went on to ride the Rás Tailteann on three occasions. Alan (aka knickers) Kearney from Trim is in the top 1% of elite adventure racers in the country and has been said by team mates "to run a hundred miles as quick as ride it." The fourth member of the on bike crew, Mick Molloy from Kilbride, Trim is also an adventure racer, a county medal winner in football with Dunderry, a black belt in karate and kickboxing. The riders were riding in aid of charities include Breast Cancer Ireland and Trim Retirement Fund.